Much as we cannot control the weather, we cannot control the flight path of the AirCore. However, before we launch, we can get a sense of where the balloon will drift over time by using a trajectory model developed by Allen Jorden in NOAA’s Global Monitoring Division. 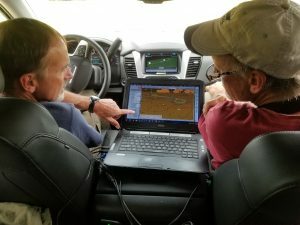 This software program takes data from regular weather balloon launches in the area, predicts wind speeds and directions throughout the different layers of the atmosphere, and comes up with a predicted balloon trajectory. These predictions are often quite good for areas with sufficient data to constrain the model, but can contain errors for other areas with sparse input data, since we are trying to predict a dynamically-changing entity. Also, because we do not know exactly how quickly the balloon will rise through the atmosphere, or the precise altitude at which the balloon will either be cut away or will burst, predicting where the balloon will travel throughout the atmosphere can be challenging. 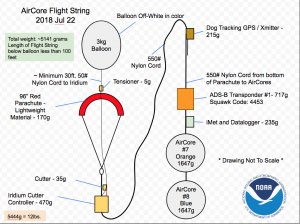 Schematic of the AirCore flight string showing ADS-B transponder, iMet, and other GPS tracking devices that are attached to the balloon payload. Jack and Tim track the AirCores during the chase. 2) an iMet radiosonde set to a certain frequency that is attached to the payload. The iMet also records temperature, humidity and pressure. 3) an Iridium satellite transceiver (also see a recent blog post from RockBlock about our use of their technology here: http://rock7.com/blog-full-post?id=44&title=CU+Boulder%2FNOAA+AirCore), and…. 4) a Garmin dog tracker. Yes, really. This is an off-the-shelf item that hunters use with their dogs, but we use it to help us find the payload once it’s on the ground. 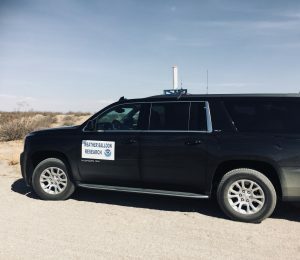 Chase vehicle with antennas attached. We load into the chase car, watch the balloon [hopefully] travel along this predicted balloon trajectory and slowly head towards the balloon landing location. 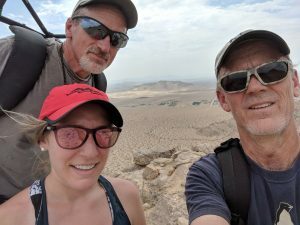 All in all, it takes a little over two hours in total for the balloon to rise to 95,000 ft. into the stratosphere and then fall to the ground where we retrieve the AirCores.